One cannot reside in Florida and linger in the distant past (as I prefer to do) without engaging the lore of the European conquistadores. I've been chewing this for a while now and continue to be surprised by all the biblical connectivity (see some initial thoughts posted here). The name most often connected with the Fountain of Youth, of course, is Ponce de León. He was a part of Columbus's second expedition of 1493, and was undoubtedly influenced by the thinking of his pious white-haired senior. Many motivations circled behind their explorations of the "West Indies." I hope to probe these more thoroughly on another occasion. Among them (surprise!) was the hunt for the Holy Land. We started with the assumption held by the explorers themselves. They believed that the "New World" was not really new at all, but merely the edgy bits and pieces of the eastern (and relatively unknown) landmass of Eurasia. Following Esdras (see our post here) along with other lines of evidence, they were convinced that they had circled a smallish earth and had closed the watery gap separating East from West. Columbus was convinced of this to his dying breath. Some of his contemporaries, however, weren't so sure. Maps produced at the start of the 16th century reflect this ongoing struggle between ancient, medieval, and modern perspectives. The surge of incoming data challenged traditional thinking. Mariners found themselves blinking at fresh charts under the Atlantic sun even as mapmakers in Europe scrambled to update graphic blends of fact and faith. 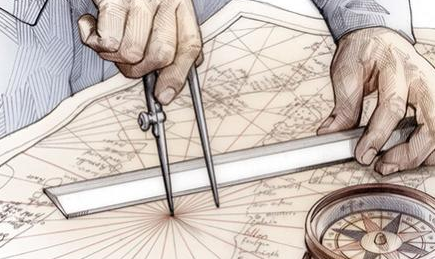 A collection of maps preserved to the present day allow us to trace this journey by "reading between the lines." Here is what is left of the Cantino Planisphere (Its edges were trimmed at some point and information was lost.). The term planisphere is Latin, suggesting the presentation of a three-dimensional sphere on a two-dimensional surface. The Cantino Planisphere shows what is known of the earth by Western Europeans at the starting line of the 16th century. Image from here. The Cantino Planisphere was drawn on three pieces of vellum by an unknown cartographer before 1502, less than a decade after Columbus's initial landfall. United, the three pieces were about the size of a sheet of plywood. It was named after the smuggler who snuck the map from Portugal to Italy (the medieval equivalent of selling secrets to the Soviets!). It shows all of what is known of the earth by Western Europeans, giving special attention to the work of the Portuguese. Note this detail below taken from the upper left hand corner of the map. The label "Oceanus Occidentalis" suggests "The Westerly Ocean." A constellation of islands are visible beneath. Two are clearly labeled: Espanola (or Hispaniola) and Isabella (Cuba). The more curious piece is the undefined peninsula in the corner. Some believe this to be Florida, although the area was not officially "discovered" by Ponce de León more than a decade after this map was made (in 1513). * Other scholars believe that this lobe represents an unknown part of China. The coastline of what would become known as South America is clearly visible. Note the peninsula on the far upper left of this detail from the Cantino Planisphere. This is likely the peninsula of Florida, even though the region was not officially "discovered" until 1513. Remember the Cantino Planisphere was drawn 1502. Note also the vertical line here dividing control of the region between Castile (Spain) and Portugal. Finally, because I can't resist, back at the center of the Cantino map is a resplendent Jerusalem. It continues to be in the European spotlight two centuries after the last crusade. Jerusalem on the Cantino Planisphere. It is not drawn to scale. The Cantino Planisphere was obsolete almost before the ink dried. Discoveries continued to come to light that demanded revision. In a short time, these new lands in the west would be detached from Eurasia and declared a "new world. "** Ironically this artistic snapshot from a pivotal moment in time was moved, then moved again. Finally it was used as a screen in a butcher's shop. It was recovered and rescued in 1868 and is housed today in the Biblioteca Estense in Modena, Italy. 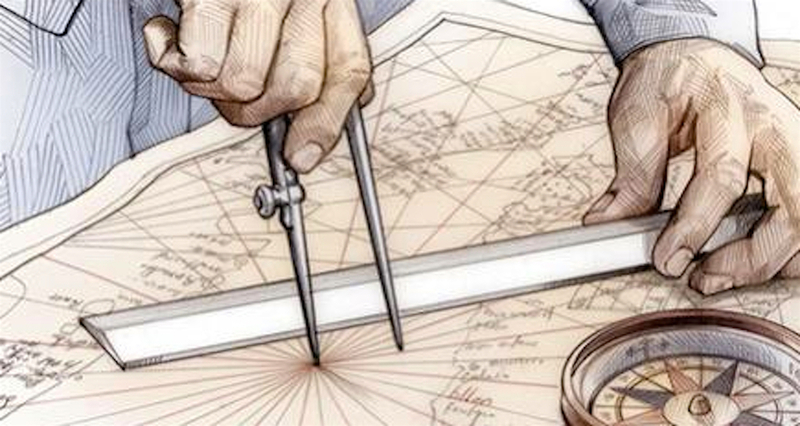 Navigation tools. Image from here. **Note: the fascinating story of developments leading up to the Cantino Planisphere are told by Evelyn Edson in her The World Map, 1300-1492 (Baltimore: Johns Hopkins, 2007). It is a detailed but brilliant read.